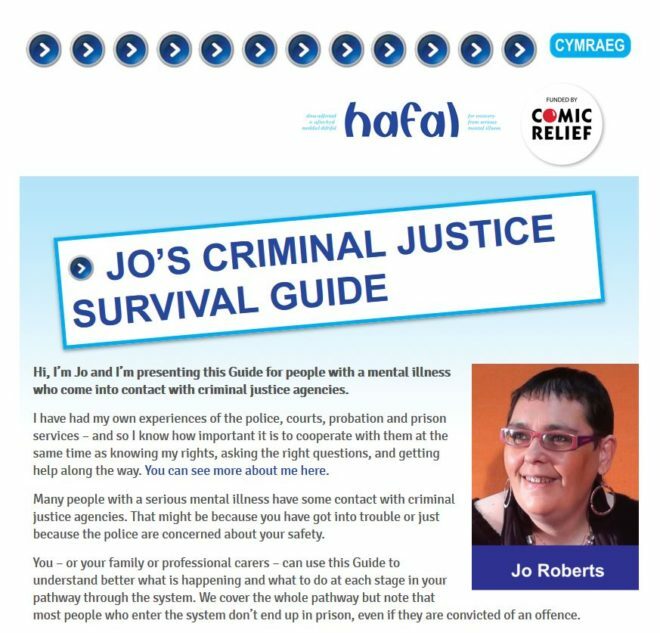 Hafal has published an online guide for people with a mental illness who come into contact with criminal justice agencies. The guide gives you key tips on your rights and responsibilities – and how you can get the best support. Hafal provides a range of criminal justice services across Wales that aim to support offenders with mental illness to help reduce re-offending. People who are vulnerable due to the nature of the offence. Hafal also provide appropriate adults for external organisations, including Department for Work and Pensions investigations and victim and witness interviews. If you would like to request an appropriate adult, email appropriateadult@hafal.org. Watch the HafalTV report on our appropriate adult service below. To find out more information or to apply to become an appropriate adult, click here. ‘Out of the Blue’ is a Big Lottery funded service that provides a mental health intervention for offenders receiving community sentences at court in the South Wales Police authority area. Low level, non-violent offenders will be referred to the service, as opposed to receiving a custodial sentence. ‘Out of the Blue’ Link Officers provide a holistic package of support to reduce offending and work towards recovery and integration with the community. Hafal Criminal Justice staff at the launch of our ‘Access to Justice’ Service in June 2015. Comic Relief fund Hafal’s ‘Access to Justice’ Service. Hafal’s Access to Justice Champion provides a single point of contact for criminal justice agencies who are managing offenders or people at risk of offending.The Champion advises mentally vulnerable individuals and their families and represents them at national criminal justice and mental health planning forums. Hafal’s Women’s Prison Link Service is funded by The Waterloo Foundation. The Service funds a team of volunteers to provide support to women from Wales who are serving sentences in HMPs Eastwood Park and Styal. Click here to read the Mental Health Wales Criminal Justice journal and find out some of the issues in the criminal justice system. Contact us if you would like more information about any of our criminal justice services. CLICK BELOW to watch a video about our Big Lottery-funded Criminal Justice Link services.